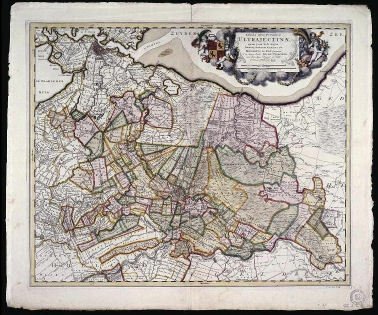 Building a historic land registry is part of a study to reconstruct land ownership for the province of Utrecht in the Netherlands in the year 1400 AD. For this purpose the kadastral maps of 1832 have been digitized en georeferenced; plots which through the centuries have been forming an entity have been taken as a parcel. This will allow the addition of information specific for that parcel both geographic as well as historic information. Next to information on individual parcels, behind the tab "lagen", various options of selecting individual map layers are available in which information can be found on the location of castles, farms windmills, inns ( tab gebouwen) as well as farms (tab boerderijen) etc, also historical names of waterways (tab sloten and water) and roads (tab wegen) as well as toponymes. The Fryske Akademie ( which is hosting this website, see: WWW:hisgis.nl ) had added functionality to open Google Maps. The buttons on the top right of the Google map, allows various options; history and today are moving closer every day. In case you have any questions or information, please "click"the contact button on the top-right of this screen and an email form will be made available, and you will get an answer.